1.-(1) A person is guilty of theft, if he dishonestly appropriates property belonging to another with the intention of permanently depriving the other of it; and “thief” and “steal” shall be construed accordingly. Tax is a “pecuniary burden laid upon individuals or property owners to support the government […] a payment exacted by legislative authority.” A tax “is not a voluntary payment or donation, but an enforced contribution, exacted pursuant to legislative authority” and is “any contribution imposed by government […] whether under the name of toll, tribute, tallage, gabel, impost, duty, custom, excise, subsidy, aid, supply, or other name” – Black’s law dictionary. To make it more simple, tax is compulsory (not voluntary) and is enforced. The government, backed up with the threat of force, compels you to give your money to it, regardless of if you wanted to or not. Taxes appropriate property belonging to another. They have the intention of permanently depriving the other of this property. Is it done dishonestly? Try not paying taxes and see how soon ‘they’ come round, force the money out of you and lock you in prison. If collecting tax is not theft then neither is a mugging. Interestingly it clearly states that ‘it is immaterial whether the appropriation is made with a view to gain, or is made for the thief’s own benefit.’ This shows that regardless if you think that public services benefit people, or that tax makes society cohesive (etc), if they are not taken voluntarily then they are still theft. While the current legal definition of tax shows that it is theft, my argument is no based on this. 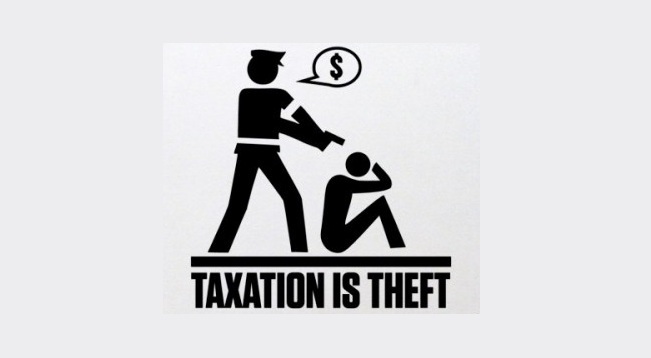 Tax is theft because it is taking without consent, breaching peoples property rights. Forcing people to give you (the government) money with threats of violence is a breach of peoples rights. While the current legal definition of theft may make tax theft, tax is theft anyway, despite the fact Government created laws are nonsense (more on this at a later date) due to the lack of consent and a breach of peoples fundemental rights. On the other hand, the first justification brought up to defend tax is that taxes are commanded by governments, which we elect, and therefore we legitimise government. Well firstly, I have never voted for tax. I have never been asked do I want to be taxed or not. No political party on any ballot paper offers 0% tax. Secondly, these people are falling foul of tyranny of the majority. In democratic countries slavery was legal and different races were seen as superior and inferior and legislated against. Just because a majority of people say tax is OK does not make it so, just as if 51% of people voted to deprive you of all your property. It has democratic justification but is not legitimate or justified in itself; having a majority support something does not make it inherently ‘right’ ‘legitimate’ or ‘good’. 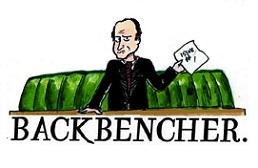 As Benjamin Franklin is alleged to have said, ‘democracy is two wolves and a lamb voting on what to have for lunch.’ Having the majority support for something means nothing, especially when what is supported by the majority is taking away from someone else, be it taking away money, property or their life. A country being a democracy in and of itself does not make its rulings legitimate or even good – democracies around the world are as equally able to commit atrocities as dictatorships. The second justification often heard is those of public services. Tax is legitimised because I use the roads, the street lighting, and the rubbish collection services. This, frankly, is an overused argument and a whole load of nonsense. The government forces me to use its services. I can’t get a private rubbish collector because the government’s monopoly means it is not viable in the private sector. I can’t leave my house without treading on state roads because the state insists on paying for them. I can’t walk under private street lighting because the government has already put street lights up via taxpayers money. When someone provides you with something, taking it does not legitimise them taking from you. The classic example is the kidnapper. If I am kidnapped and locked in a cage, taking food from the kidnapper does not legitimise my kidnapping. By eating food provided for free by the kidnapper to keep myself alive I am not consenting to be kidnapped. Equally, by using the roads or any public services I am not consenting to be taxed – I am taking the service (food) that the government (kidnapper) provides. It is the only food (service) that I am able to eat (use) because the kidnapper (government) does not allow others to provide alternatives. The third comment that is often thrown is that one is consenting to tax simply by staying in the UK. This argument overlooks that tax is used by every country that I can think of, and that to work almost everywhere is to be taxed. If the only choice anywhere is ‘A’, being forced to pick ‘A’ does not mean that one consents to it. Furthermore, would you say to the person who gets mugged ‘you consent to it by staying in a city where muggers operate?’ Of course not. It is like saying that Jewish people consented to the Holocaust because they lived in Germany or similar occupied territories, an utterly absurd and offensive idea. I do not have to flee to a remote uninhabited island because I do not wish to be stolen from, any more than you do because you wish not to be beaten up, or because you don’t want to have people trespassing on your property. Staying where you are is not consenting. If you are happy to pay tax then good for you; it does not mean that all others are too. Just because you are happy to give money to something does not mean that everyone else is as well. Finally, you will have noted the complete absence of the term social contract in this piece. 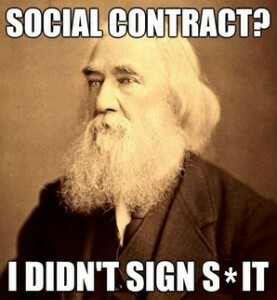 Simply put that is because I have never signed a social contract. If a contract isn’t based on consent, it isn’t worth the paper it is signed on, and I haven’t even seen, let alone signed, any sort of ‘social’ contract. Government obviously fills a) because it makes the law, but this is irrelevant in the same way that the Holocaust was legal because Hitler made the laws, and is typical Government hypocrisy saying that something is legal for them and not for others just because.